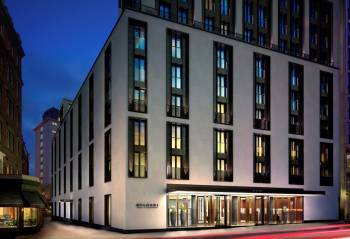 The Bulgari hotel, situated in the heart of Knightsbridge, offers some of the largest hotel rooms in London. The 85 rooms and suites combine English style with true Italian heritage and feature a luxurious variety of marbles, fine woods and unique detailing with many furnishings made exclusively for Bulgari, giving a uniquely intimate and sumptuous feel. Each room is splendidly luminous and many feature views over Hyde Park and Knightsbridge, offering an oasis of comfort and luxury within the hub of this metropolitan area of West London.Each bedroom boasts 42 inch plasma TVs, Nespresso coffee machines, complimentary wireless internet and Bulgari amenities, making the Bulgari Hotel London the perfect venue for any occasion. Bathrooms are spacious and demonstrate the attention to detail that Bulgari is famous for, with free standing baths and showers, exquisite Marquina marble and white Navona travertine stone. The Bulgari Hotels & Residences, London and its staff have gained a lot of experience with arranging meetings, conferences, trainings and all sorts of events. Offering conference facilities including 3 meeting rooms the hotel has been used as a conference hotel in STADT on a regular basis. Please also have a look at the other conference hotels in London which we are proud to present to you.